You would think that I’m done talking about gifts. Sorry, there is one more, a super special gift received from Celia, the bread baking Goddess Extraordinaire from Australia, hostess of the equally extraordinaire food blog Fig Jam and Lime Cordial. She found out that it was my birthday last month (full disclosure: I told her), and sent me a bread cookbook: Josey Baker Bread. I was traveling at the time, but could not wait to get my hands on some flour, salt, and yeast to put my gift to use. Of course, my first thought was sourdough, but we’ve been so busy lately, that every Wednesday would come and go, and I never remembered to revive my starter, hibernating in a – 20°C freezer. Finally, I could not wait any longer, and tried one of the simpler recipes using commercial yeast. This is by far one of the easiest breads you can make. All it takes is preparing a pre-ferment with whole-wheat flour, allowing that to sit at room temperature overnight, then proceed with a no-knead formula next day. OVERVIEW OF THE RECIPE: to make this bread, you will start by mixing whole wheat flour with water and a little commercial yeast. That mixture will bubble away overnight, and will be part of the final dough, which contains only white flour, a little salt, lemon zest, fresh rosemary, and of course black olives. I actually omitted the rosemary because I did not have any at home then. I increased the amount of lemon zest, but other than that the recipe was followed to a T.
It is essentially a no-knead bread, with a very flexible schedule as far as preparing the dough and baking it. This is one of the things I loved the most about his cookbook: Josey offers a timetable for all his recipes, so that you can adjust making bread to your own schedule, no matter how busy you are. If you rather stay up late to bake, follow one particular timing. If you prefer to bake first thing in the morning, follow another one. Baking in the end of the afternoon? At lunch time? It’s all doable. Part of the beauty of working with yeast. If you are new to bread baking, this book will be perfect for you, because it totally demystifies the process. Reading the book is the closest thing to having a class on bread baking given by a pro who behaves more like a friend, not a snotty professor. Yeap, that is what Josey Baker’s book is all about. If you want the full recipe, it is available online, reprinted with permission from Josey on this site. 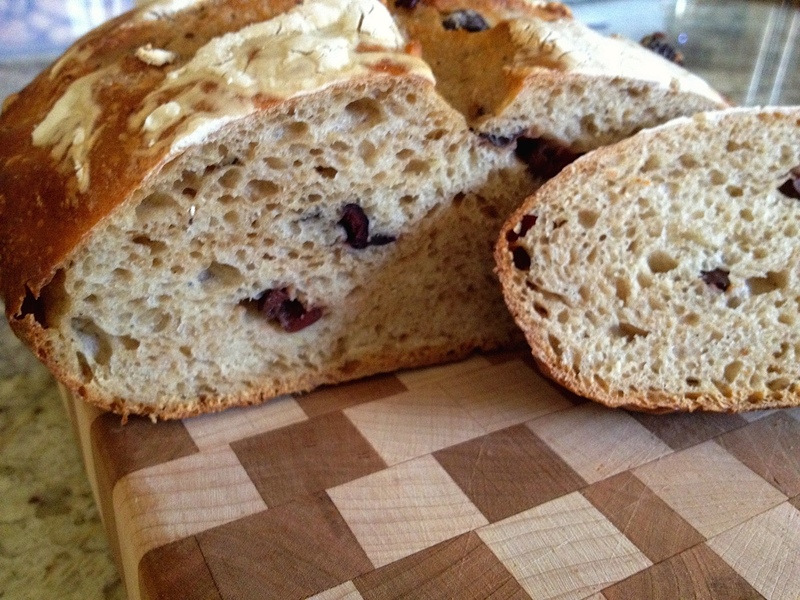 For a no-knead bread, the crumb has quite a nice structure, and the taste is wonderful! 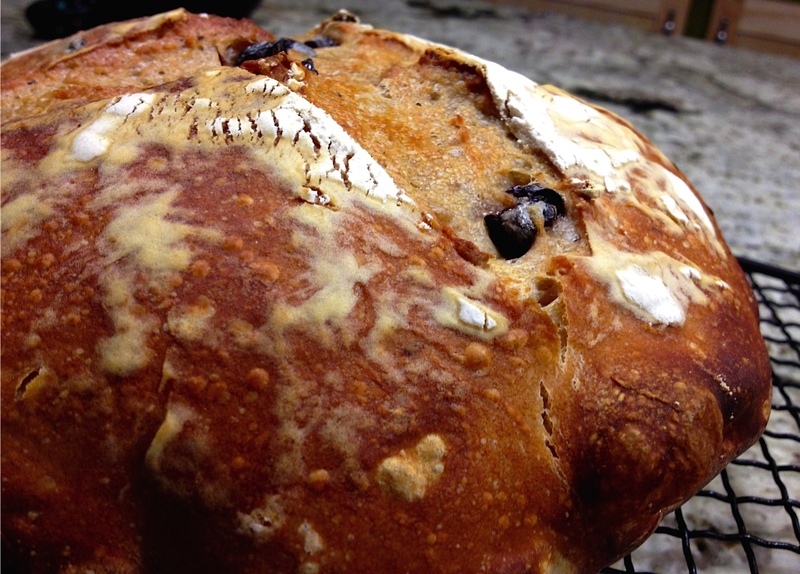 The lemon zest was very prominent, and I think rosemary would make this bread perfect. But I would never substitute dried rosemary because I dislike its texture. In fact, one of the spices I rarely use in dried form is rosemary for that very reason. Unless it is part of mixes such as Herbes de Provence, but in that case it is pretty much pulverized and the drawback of harsh texture is eliminated. Still, get your hands on some fresh rosemary, grab your bag of flour and make this bread. The smell while it bakes is out of this world delicious! And refrain from grabbing one of those olives that will be peeking on the surface of the loaf. It is bad bread etiquette, and resisting that temptation builds character. HA!